As this is a double-header week, all of the teams playing on Thursday and Friday night will have already been in Euroleague action this week. This means that there will be issues of mental and physical strength to consider as well as the form of the teams involved. However, this game features the hosts with a 3-0 record and an away team with a 0-3 record. You have to think that we’ll be looking at 4-0 and 0-4 record by the close of Thursday evening. CSKA Moscow continued their fine run of form with an 87-93 win in Turkey over Anadolu Efes Istanbul. The reigning Euroleague champions are already looking rather impressive but over the past few seasons, the Russians have always excelled at this stage of the season. 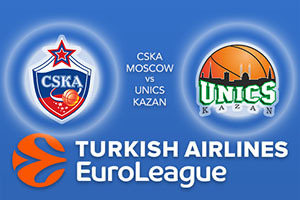 The Euroleague may have changed format this campaign but there is no difference to the way the side from Moscow steamrolls their opposition. Of course, it helps when you have two of the best players in the league playing for you and if Nando De Colo and Milos Teodosic are fit and ready to play, it could be another pleasing night for the home fans in Moscow on Thursday. UNICS Kazan slipped to an 87-95 defeat at home to Darussafaka Dogus Istanbul on Tuesday night and they’ll be lacking in confidence heading into this game. No one wants to take a trip to Moscow to take on the champions when they are absolutely flying but you really don’t want to face it when you have lost three games in a row. There are only two teams with a 0-3 record at this stage of the campaign, and two teams with a 0-2 record so far, but UNICS cannot afford to fall behind. The thing is though, this game may be about damage limitation as opposed to pushing for victory. You cannot see beyond the hosts for this game and you should look to take CSKA Moscow at -16, which is provided at odds of 1.90. For the Over/Under market, look to go OVER 167.5 which is also on offer at odds of 1.90. Bet Now!